The blinis pan from De Buyer's French Collection B Element line is made of 100% natural steel with an organic beeswax finish, making it perfect for sealing, browning, frying on all heat sources, including induction. 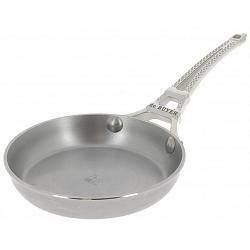 The blinis pan is perfect for making delicious Russian blinis or pancakes. The French Collection B Element blinis pan has a diameter of 12cm / 5" and is proudly made in France.